Our Host Peggy Anne Salz from MobileGroove catches up with Tim Armoo—the 22-year old CEO of Fanbytes, billed as the world’s first Snapchat influencer platform helping brands like Warner, Universal, and Sony power new approaches to reach teens on Snapchat. 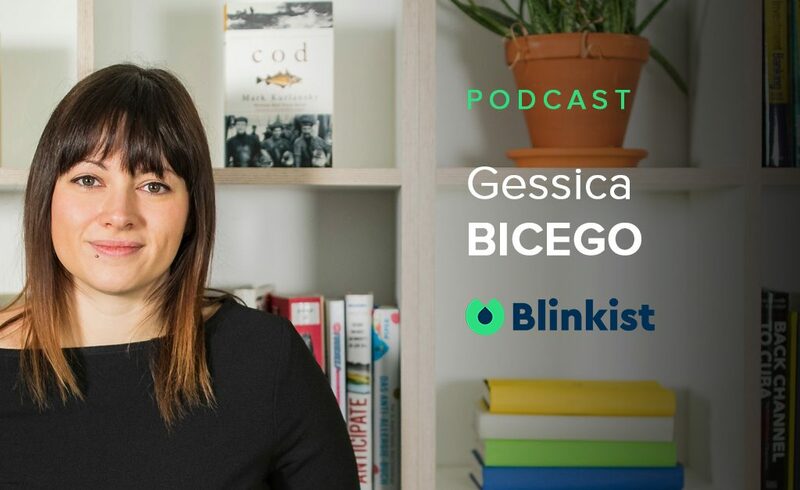 He discusses blockbuster campaigns and walks through how marketers can tap influencers and the new sandwich ad format to connect to teens in ways that are real and drive real results. Hello and welcome to Mobile Presence. I’m your host, Peggy Anne Salz, Content Marketing Strategist at Mobile Groove, where I plan, produce and promote content that allow clients to reach performance goals and scale growth. And it seems that one we did do both is to embrace influencer marketing, that is to reach, engage and, above all influence your target audience, particularly when it’s sort of 13, 18, 20 – so in that range. But, the question is, is it really? Because it’s a tough question to answer, one that I seek to answer, by the way, as a regular contributor to influencerupdate.biz which is where I will be, as of this month. It’s a website dedicated to how the games industry is using influencer marketing to move the needle on mobile apps and titles and games there, but there’s loads we can learn from the games industry so I suggest you bookmark that website, influencerupdate.biz and check out my posts over there. But of course, in the meantime, the best way to understand the trend and ride the wave is to tune in and listen to someone who’s been doing this 24/7 and that’s why I am thrilled to welcome our guests today, Timothy or Tim Armoo to Mobile Presence. Great to have you, Tim. Hey, great to be here, great to be here, thank you. Well, you know, Tim, it’s great to have you too and I’m looking forward to this show above all because I think this is the one where I’m going to learn loads as well because I’ve been reading up on Snapchat, we’ll get into some of that data later on in the show, just how popular this platform is, but now some background on you, Tim. You’re 22 years old, that’s amazing in itself, you’re the CEO of Fanbytes, billed as the world’s first Snapchat influencer platform helping brands like Warner, Universal and Sony – so these aren’t small brands, these are major brands – reach teens on Snapchat. Your blockbuster campaigns, I want to hear about these, of course, been featured in the likes of Forbes, where I’m a contributor, Huffington Post, Business Insider – I have to write about you myself then, actually, you’re getting around there, Tim, getting and making the rounds. And lastly, and this is the most amazing, I’m going to start with this one – Fanbytes is, as I understand it, your third company having already started your first at 14, selling the second at 17 – I’m going to start right there. How is that possible, how you can have your third company at the age of 22? What happened, tell me a little bit of that entrepreneur dream come true here. So, my first company was at 14 and that was a tutoring company, it actually started off as a bet with a friend of mine because we saw these bets and he asked me how much do I think that costs and I said I think it costs £500 which obviously, when you’re 14, £500 seems like an obscene amount of money, so he made a bet with me that I wouldn’t see £500 if I turned 18 and so I decided then to work with what I knew and this has actually been quite a big part of my life, this idea with working with what I know and I started tutoring people in maths, because I was pretty good at maths as a kid, and then eventually other people who wanted tutoring in other subjects came to me, like Physics and Spanish and French, and I didn’t know any Physics, Spanish or French, so therefore I decided to hire other people who I knew who had that capability. Absolutely, I’m dumbfounded here, just speechless here. So you start like the equivalent at what – maybe the age of 17 – you start the equivalent of Fast Company, am I hearing this, and then you get these great guys to give you interviews. Yes, so we kind of called ourselves theentrepreneur.com for really young people and that was great. Ended up selling that company after 11 months and then I then had some soul searching, I did my exams and stuff, and then I then started Fanbytes about two years ago. So this is a Snapchat influencer platform and I was reading about even a programmatic platform behind it. I mean, first, I guess the question is why Snapchat because when you’re thinking about influencers, you’re thinking about the YouTubers, the Putiepies, whatever – I guess that’s so yesterday that’s just not cool and the cool factor is in Snapchat. What’s the attraction there? So, if you Google Fanbytes, what you’d realize is that we actually did do things on YouTube and Instagram prior, and we did pretty well in that, we started to work with brands like Go Pro, Adidas, Nickelodeon, it was pretty strong. What we however realized was two things and we moved to Snapchat as a consequence of two things. The first one was that we thought that if you are really trying to engage with a younger audience, these guys, especially people under the age of 21/22, they’re really spending all their time on Snapchat and Instagram, YouTube is great but that’s for targeting much older audiences. And then the second thing that we were keen on doing which we wanted to really own the markets because we realised that the market of YouTube influencer, Instagram influencer stuff, it’s a very easy market to enter and exit, and it didn’t feel like we actually owned anything – there are so many agencies or these one-man bands who basically call themselves these YouTube influencer networks but really it’s just an Excel sheet of a bunch of influencers that they’ve seen online and they go to brands and say Hey, we can help connect them to you. So, for us, it was just like how do we own a market, we realized that brands were really struggling with Snapchat and decided that would be our focus. So, just for some thinking around here, Snapchat, we’re talking about that – it wasn’t doing so well last year, to be honest, 2017 was not a great year for Snapchat but I’m just reading some interesting stats and I’ll share them here with our listeners as well. So, one of the tests is to figure out, OK, 13-18 years olds, is that what they will want to have on a desert island, right, and so there’s this report that comes out from – what’s it called here, I’m reading it as we speak – it’s a social media report from RBC Capital and it updated its numbers since so it has asked participants 13-18 which social networks they would keep if they were trapped on a desert island. 44% picked Snapchat ahead of Instagram, 24%, Facebook way down – the oldies here, 14%. So it’s getting a lot of interest – was that attracted – it is your demographic but is it something where you’re saying this is also the one to watch? So there’s a story online actually about when Snapchat went public, I invested in Snapchat shortly after they went public and the reason why I invested in them was because one of our big bets is Snapchat is going to be the future of TV for younger people and in a way in which Facebook, Instagram etc are not able to be. An interesting fact, an interesting anecdote is a niece of mine thought that Cosmopolitan, the famous media brand, Cosmopolitan, was just a channel on Snapchat. That’s her gateway into what Cosmo is because that is her first screen in the way she interacts with the world and so when we thought about that as a bet, this was going to be the future of TV for younger people, we realized that there would need to be a company over there which is able to be the media and advertising company to help brands to reach that audience. And so that is, that also forms part of the reason why we focused on that because the audience was there, we wanted to own a market but also because we have this bet, this is kind of going to be the future of TV and how younger generations consume content. I can’t agree with you more because I’m thinking I just had my niece to visit over the holidays as well and that’s it, that is the world. I’m just curious, we’re going to be going to a break in just a minute but just in a nutshell, really quickly, the user experience that people listening in who aren’t using Snapchat – I’m going to admit it, hey, I’m one of them, I got my head around Instagram, I consider myself progressed for that – it’s tough to imagine delivering any sort of brand message over Snapchat but then again I was at a conference last year and CNN was saying hey guys, we use this to deliver news. So, what exactly is it that you can deliver on Snapchat? So, Snapchat pioneered this whole idea of stories, these ten-second video or picture clips that you can use to interact with the world and everyone uploads content as a story and that story would be able to be viewed by all their friends. And that story could either be a brand experience or it could be like an ad, it could be someone talking about a brand or it could just be as in the case of CNN, it could just be a publisher showing their news but in ten-second clips. So rather than CNN, which typically is always on 24/7, they could just show different clips, short animated clips for people to interact with it. And that is the reason why they’ve seen so much success because they’ve done fairly well and been able to take their content, which is always on very serious and have turned it into something which is more fun and byte-size. Exactly, so it’s all about bite-size content with appeal and when we get back, we’re going to talk to Tim, we’re going to find out more about his campaigns and how he’s just become the first ever Snapchat influencer platform – Fanbytes – so don’t go away, we’ll be right back after the break. Welcome back to Mobile Presence. I’m your host, Peggy Anne Salz, with Mobile Groove and our guest today, Tim Armoo, he is the CEO of Snapchat influencer platform, Fanbytes. And Tim, right before the break, we were just talking about just the whole idea of what to do on Snapchat, it’s bitesize content but you yourself, you’re also a Snapchat influencer. So, tell me, how does one become one? I think one becomes one – it’s a combination of two things. The first one is raw unique content. So, I’ve built an audience on my Snapchat because the sort of content I post is quite unique to the platform. So, I might post interesting stuff that I’m reading and interesting business ideas that I might have or just interesting things around entrepreneurship which typically, if you were a user on Snapchat where everyone kind of does things in a very hey, I just woke up out of bed – no-one really owns that particular segment. What I’ve done is I’ve decided to own that and make myself unique in that way. And the second thing is really taking advantage of the two-way interactions that Snapchat itself has. It’s not like Facebook or Instagram or Twitter where it’s very easy to be a passive consumer, just scrolling, scrolling, scrolling. On Snapchat, they encourage you to message and to chat and when people send you a message, actually then talking directly back to them in a friendly personal way, a combination of those two – the idea of being unique and also really being personable I found has been the key to being an influencer. And you’ve got a platform, so it doesn’t mean just like I’m an influencer and I’ve got a couple of friends who are influencers and we’re going to hang out and then people are going to come to us and give us money to make endorsements – this is a bit more sophisticated than that. So, tell me a little bit more about Fanbytes. How would I engage with it? Yes, so we found that brands – when we looked out into the market, we found that brands struggle with two things. The first one was actually creating content for Snapchat, so they were really keen on reaching the young audience but they didn’t know how to and the two key problems were the first one was content – actually creating content for that audience because Snapchat was and is a different beast, right? So, it’s 100% on your phone, 100% or mainly video and is vertical video, and a lot of brands didn’t have the capabilities to create that at scale. The second problem was this idea of distribution, so for your audience who do have Snapchat, they will know what I’m talking about, but for those who don’t, as I mentioned, Snapchat is done through stories. So, I upload a story, then I watch my other friend’s story etc, and typically their ads are inserted in between people’s stories. But because the ad could be a random thing, so, for example, I might be watching your story then going to watch my other friend’s story and randomly an ad for, you know, make-up comes up or an ad for something completely irrelevant and out of context comes up, people skip those ads as well really quickly. So there were these two problems here of firstly not understanding how to create content because it was a completely new platform, but also this big problem of ad skip ability, people would just skip the ads really quickly because they were out of context and didn’t have relevance. And so as a consequence, what we do as a company is we’ve assembled this network of designers and creatives who create ads for brands on demand and the great thing is all these guys are very young. So, we’re talking like 16-year-olds in graphic design colleges, 17-year-olds who really understand the fabric of how to really engage with audiences on Snapchat. And then they create the ads and then we’ve built technology which then programmatically inserts those ads into influencers’ stories and what’s happened is the influencers then introduce the ad and encourage their viewers to then go and watch it. So, in the past, you typically have a random ad just shoved in between stories with no relevance and no context at all, but in this case, you can have an influencer whose audience is really big into gaming or actually is really big into sports and then Nike will come to us and say Hey, this 10 second ad that your design team has created, we’d like you to distribute it through our influencer network. Then a sports influencer or someone who’s crazy about football would say Hey, check out this crazy new pair of football boots that are coming out in the next Snapchat, and then their audience would see it, but now it has context, now it has relevance because it’s from a sports influencer and they haven’t just shoved it on you, they’ve actually kind of said to you Hey, this is coming, check it out. So, if I’m reading this right, this is a little bit different from the usual work with an agency or don’t work with an agency – I come to you as a brand, hopefully consumer-facing, it’s not the kind of thing you’d come if you were like John Deer and you sell tractors, I don’t know, but hey, whatever. We’ll say consumer facing, and incidentally translating the football boots means that that is sneakers to play soccer – football, or something. So, I come to you and I say OK, I want to have an influencer and you’re going to find me one that matches my brand and on top of that, I want to have inserted in there, advertising that’s relevant, you have a programmatic platform that’s going to pick the relevant advertising and you’ve got a network of guys and girls out there in this age group that are going to make the ad for me. Does that sound about right? So, the other 20% is that brands come to us and they just are trying to reach an audience, so they’re not saying to us, Hey, go and find me this influencer – we don’t go out and go and find an influencer. All the influencers are already signed up into our network. We already have their audience demographics and brands will just come and say, so in that sneaker example, a brand might be saying I want to target 15-18-year-old boys in the UK and then we have the influencers in our system – we know the best ones who have that audience and then from an ad that has been created by one of our young designers, that ad is then programmatically inserted into that influencer’s story. Got it, OK, very cool. So, I’d love to hear about just a straight example – we’ve been talking about Nike as if that’s sort of one of them but you have worked with some amazing brands, you’ve been doing this now – how long have you been doing this, Tim, on this platform? A year? Yes, so just a year on this platform. OK, so tell me about a real-life example, maybe keep the numbers to yourself but tell me how this really worked and maybe an exciting outcome. Yes, so we’re fortunate enough to work with, like, pretty much all the biggest brands especially in the entertainment space as well, so as was mentioned earlier, Universal, Warner, Sony and a number of also music streaming brands. I think the one that really was very, very cool was – I don’t know if your audience would be familiar with an artist, or maybe you’d be familiar with an artist called Charli XCX – I don’t know if you know who that is? I’m going to say no on this one – sorry. Checking after the show though, I’ll tell you that. So, Charli XCX was a famous, I say was, she is a famous pop singer and she came out with a song called “Boys” – it was about 4 minutes of her just talking about boys, it was an interesting song. And Warner came to us and said Hey, we’d like to drive some engagement for this etc. So what happened was our design network created an ad, it was like a ten second clip of the video and then what happened was programmatically we then inserted that into the stories of our influencers and our influencers were like Hey guys, there’s this cool new single out by Charli XCX and it’s completely outrageous and it’s really cool – check out the next snap. And the results of the campaign from a conversion perspective were pretty strong. So we ended up getting like a 16.1% click through rate which is like completely unheard of in the world of direct response and that type of stuff. We ended up getting a 16.1% click-through rate and ended up getting over a million views on the content. So, that’s an example of like a known brand. I think for your audience, in the mobile app space, we’ve done some stuff whereby through this exact same activation, we’ve generated CPIs of about 30 cents and 50 cents, especially for mobile apps who are in the kind of social gaming and social messaging space. And so that there just gives some idea of the type of results this advertising does in terms of for big brands like Warner Music getting 16% click-through rate is practically unheard of and right after that they were just like Hey, can we just do a ton more and then even in the direct response space with apps, we were able to generate 50 cents, 30 cents, CPIs for them as well. So, those are some amazing results and of course, you know, all of the platforms are competing so heavily to win over the minds of the centennials – Instagram, Facebook etc. It just makes a lot of sense to get your head around Snapchat if this is indeed your target audience. So, when we get back after the break, we’re going to talk a little bit more again about the nuts and bolts of this, maybe how you can even get involved. So, don’t go away, we’ll be right back. Hello and we are back, welcome back to Mobile Presence. 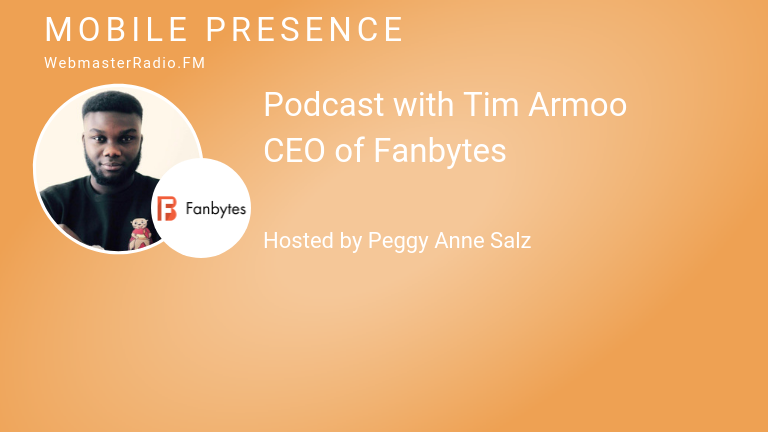 I’m your host, Peggy Anne Salz, with Mobile Groove and today our guest is Tim Armoo, he is the 22-year-old CEO of the Snapchat influencer platform, Fanbytes. Tim, it’s been an amazing show with you, I’ve been like thinking is something we ought to hear more and more about. Great to have you, I’m so glad you reached out and agreed to be a guest. Yes, thank you, thank you for the opportunity – pretty cool. It’s cool. It’s cool stuff. And so, I’m imagining listeners are thinking to themselves, yes, this makes sense, you know, even if they’re not marketers, maybe they are practitioners. So, let’s just take the idea of saying someone is listening and saying Yes, I want to be a Snapchat influencer. I’m just curious, as you are one yourself, you picked out your niche, you did your thing – what would be your tip or your advice if you’re saying to someone here’s how you become an influencer, and maybe even someone eventually on your platform? Yes, so I think the first thing is to really appreciate the fact that you do not need sophisticated video editing software because the way Snapchat is and the way the community is, it lends itself very well to just being raw and authentic and being somewhat amateur. The key thing, however, I would say, is what I mentioned earlier – you want to own a niche so you really want to own a niche. Some of the really best people on Snapchat are people who have decided to go down a certain path like drawing cartoons every single snap, using the tools they have. Or perhaps solely focusing on a specific vertical, like solely doing make-up or beauty products. So, you really want to own a niche and the wonderful thing is that there is an abundance of niches and there is an abundance of sub-niches within those niches. So, really those two things and saying why would someone watch my story as opposed to another person’s story? And that is all about owning a niche and really building a brand from that. And really those two things because I see several people come on and say I want to be an influencer, I want to be an influencer, and I look at their content and they have like 50 views and I’m like – did you really expect to be an influencer when your content is the exact same content I can get from anywhere. It’s hey, I woke up today, hey, I’m at the store. It’s not particularly interesting. So that’s one side of it, that’s how to be an influencer. Just real quick, what about I’m a business looking for a platform like yours – what would be a question or two I need to ask myself or something I need to have top of mind so I land with the right people, you know, the right influencers as opposed to those pseudo influencers, for example? The ones who got up out of bed and went downstairs to have some cereal and think that that’s something amazing? So, the first thing I’d say is ask yourself what is the compelling story behind my product. If your product is a very kind of generic product, in fact, even the most generic of products can have a compelling story behind it. What is the reason why someone would actually in that 10-second space where I’m getting an influencer to like talk about me, in that 10-second space what is really compelling that I can say in that 10 seconds that will get people to check out my brand or my app, or something like that? And I’d say that there is actually is the cool question you need to ask. What is the 10-second story I can tell my consumers as to why I am great? You know, Tim, I’m thinking we’re going to have to have you back because I think that this just scratches the surface, I could go on – I’ve got quite a number of questions about even just things like how do you measure influence, how much you’re going to have to spend – we could go on. Unfortunately, we are coming to a close. Of course, the question how do people stay in touch with you, which is how I end every show, this is an easy one – you’re on Snapchat but, seriously, how can we actually really stay in touch with you? What do we have to do – we have to follow you on there but what are you on Snapchat? Yes, my Snapchat is just timothyarmoo but for me, the easiest way is just to email – email I think is never going to die. Email tim@fanbytes.co.uk and that’s the easiest way to get me. Absolutely – and Fanbytes but I’ll have more of that in the show notes, of course, that accompany the show. Tim, great to have you as I said. We’re going to have you back and friends, if you want to keep up with me throughout the week or find out more about how you can be a guest or sponsor on Mobile Presence, then you can email me, peggy@mobilegroove.com, Mobile Groove is also where you can also find my own personal portfolio of content marketing and app marketing services. And that, my friends, is a wrap, I really hate to see this one end but until next time you can check out this and all other earlier episodes of our show by going to webmasterradio.fm or you can find our shows on iTunes, Stitcher, Spreaker, SoundCloud and iheartRadio simply by searching Mobile Presence. So until next time, remember, every minute is mobile, so make every minute count.